Pictures of Soldiers near the Stobs Internment Camp, Scotland. Study of Germans interned in Scotland during WW1 has found many were afflicted by "barbed wire disease". A project to promote a less than well-known part of Borders history is looking for volunteers. The surge of interest in the site of the Stobs prisoner of war c, amp, near Hawick is being backed by the Heritage Lottery Fund. Due to its extraordinary level of preservation Stobs Camp is an internationally important site relating to Scotland’s preparation for and subsequent handling of First World War prisoners. Huge amounts of information exist in a variety of places that will be brought together to share its fascinating history. The project would like to hear from anyone who has stories related to Stobs they would like to share. Stories might relate to what it was like to live near the camp, the impact it had on Hawick and the wider Borders and, of course, information and artefacts relating to the soldiers and internees. Stobs Camp Project is hosting an information evening on April 20 in Hawick Lesser Town Hall from 7pm, and everyone is welcome. There will be short talks from project partners and a chance to ask questions. The project, funded by Historic Environment Scotland and the Heritage Lottery ‘World War One, Then and Now’ fund, brings together interested parties from a number of national, local and community organisations and Stobs’ landowners. This will be led by Archaeology Scotland with support from Scottish Borders Council, Historic Environment Scotland, academic and military experts, the Hawick Archaeological Society, Callants Club, Hawick Museums and local schools. The project aims to promote an understanding of Stobs by inspiring people to investigate the archives, record the remains, restore the cemetery, improve access and develop a long-term conservation plan. The objectives for 2016 are to engage local communities with workshops and to gather momentum and resources for a larger project that will run through to the end of 2018. A website is also being redveloped, to act as a repository for research and stories. 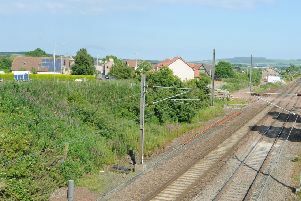 The group will host workshops for volunteers and schools, surveying the standing remains, plotting the changes of use for the site over time (including the hunt for the missing huts sold off in the 1950s), clearing vegetation at the abandoned cemetery, researching past internees and generally helping to fill in the identified gaps in the whole story of Stobs. In the longer term organisers hope to build a digital 3-D model of the camp, fully record the remaining features, create better access to the site, create traditional and digital interpretation, host and maintain the online repository, develop a conservation plan and restore the cemetery and memorial. There is also the intention to forge links with families of former internees and the British regiments who trained at Stobs, which would culminate in an international commemoration event, scheduled for Armistice Sunday, 2018.